U.S. Army Specialist Troy Davenport III, honorably discharged in 2005, has a heart for helping other veterans pursue higher education by obtaining their G.I. Bill benefits. 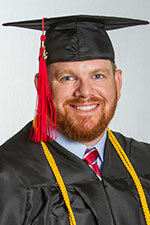 Over the past four years, Davenport used his own education benefits to earn multiple degrees, including a bachelor’s in organizational leadership from Simpson University’s School of Adult Studies, ASPIRE degree-completion program. Davenport, a 34-year-old Paradise, Calif., resident, was one of more than 230 students who graduated during Simpson’s spring commencement ceremony on April 30. He was also inducted into Alpha Sigma Lambda, a national honor society for continuing education students who maintain at least a 3.8 grade-point average. Davenport first attended Butte College in Oroville, Calif., in 1999 but left school to join the Army. He returned to Butte in the spring of 2012. After completing associate degrees in social and behavioral sciences, Davenport tried transferring to a local four-year university, but after multiple complications in the intake process, he decided to look into the ASPIRE program. Davenport started taking ASPIRE courses in the spring of 2015. He was a part of a 16-month-long online degree program. 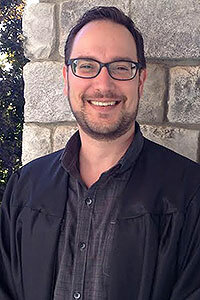 He connected with professors and classmates using Skype and Moodle, Simpson’s online learning management system. In addition to organizational leadership, the ASPIRE program offers an online B.A. in psychology. Davenport said he liked many features of the ASPIRE program, including support from his classmates and the instruction he received from his professors. Soon after starting his ASPIRE program, Davenport was diagnosed with a rare autoimmune disorder that affects the brain. This illness led to multiple stays in the hospital, chemotherapy, immunotherapy, and neurological examinations. Although he just received his degree, Davenport has already incorporated what he has learned into his job working with veterans at Butte College. Davenport plans to keep working at his current job. Based on his positive experience in the ASPIRE program, Davenport said he would recommend it to others. Paradise police Lt. Gabriela Tazzari has never been afraid of a challenge. She passed her latest one with straight As, graduating from Simpson University with honors and a bachelor's degree in organizational leadership. "Organizational Leadership is great for law enforcement because it breaks down areas of business," Tazzari said. "The degree gives you a lot of different perspectives of an organization." 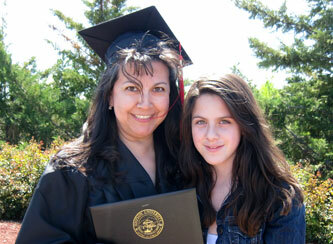 Tazzari was one of 103 ASPIRE students who graduated Jan. 22 during Simpson's winter commencement in Redding. ASPIRE is a degree-completion program designed for working adults. Classes meet on weeknights or weekends, and a degree can be earned in 16 months. Born in Argentina, Tazzari, 42, moved to the U.S. with her family in 1978. One of her earliest challenges was overcoming the language barrier in high school. "People who aren't confident about their language should know that you can do it," she said. "Hard work really does pay off." That work ethic helped her get a job in law enforcement in 1994. After several years in law enforcement she went back to school and graduated from Golden West College in Southern California with an AA with honors. After promoting at work, and later relocating to Northern California, she looked to get her bachelor's degree; however, most schools were not a good fit for her busy schedule. "School was always my goal, but my career put that on hold," she said. "Every time I was promoted, I would have more responsibilities." Tazzari was working for the Mount Shasta Police Department in Siskiyou County, when she learned that Simpson has an ASPIRE cohort that meets at College of the Siskiyous in Weed. She applied and decided to major in organizational leadership. ASPIRE also offers degrees in business management; liberal studies; and psychology. As a police officer, Tazzari never knows what a day will bring. "You can't predict emergencies," she noted. "ASPIRE is high-paced but not so much that it's not manageable." 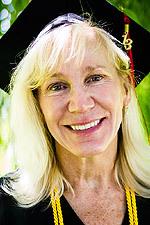 When Tazzari moved to Paradise midway through her studies, Simpson University worked with her so that she could take classes at the main Redding campus, shortening her commute. "It's been challenging at times," she said. "This is a very demanding job." But Tazzari persisted and earned a 4.0 grade-point average, qualifying for Alpha Sigma Lambda, a national honor society for continuing education students. Her family cheered her on as she walked across the stage at Simpson University to receive her diploma. The success she's had in this challenge is inspiring her to think further – possibly about earning a master's degree. "I feel that earning my degree really helped with my career and my future," she said. Orland resident Rafael Ortiz moved to the U.S. from Mexico when he was a teenager. 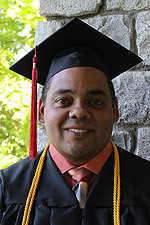 The son of migrant workers, he became the first member of his family to graduate from college on Jan. 21, when he received a bachelor’s degree in organizational leadership from Simpson University’s School of Adult and Graduate Professional Studies, ASPIRE program, during the university’s winter commencement ceremony. 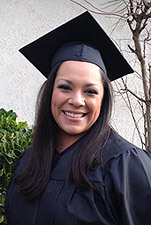 Morales, a 45 year-old Willows, Calif., resident, enrolled in Simpson University’s School of Adult Studies’ online psychology degree-completion program. He was familiar with an online program format, having completed an associate’s degree in Christian Ministry from The Kings Seminary in Van Nuys, Calif., mostly online. Morales, along with over 200 other students, received degrees during Simpson’s spring commencement ceremony on Saturday, April 25. Students from the traditional undergraduate studies program, ASPIRE, the School of Education, and A.W. Tozer Theological Seminary participated in the graduation proceedings. His high GPA made him eligible for Alpha Sigma Lambda, a national honor society for continuing education students who receive a GPA of 3.8 or higher. 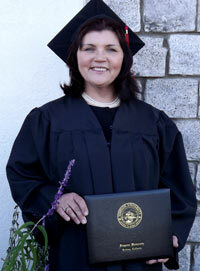 While in ASPIRE, Morales was part of a 16-month-long online degree program. He stayed connected with professors and classmates by using Skype and Moodle, Simpson University's online learning management system. In addition to psychology, the ASPIRE program offers an online bachelor of arts degree in organizational leadership. Morales started the ASPIRE program in January 2014 while he was living in the small town of Stonyford, Calif.
Simpson’s online psychology program accommodated Morales’ busy life. While living in Stonyford, he served as a church pastor and worked part-time as a school bus driver and in the general store. A year ago he moved to Willows and started working as a print and mail services assistant at California State University Chico. Earning his degree was not an easy task for Morales. He had to balance work, family, and school responsibilities. He also faced financial struggles. After graduation, Morales plans to find a job in a psychology-related field using the new skills he has learned. He also hopes to attend graduate school and go into a career in counseling and/or therapy. Based on his experience, Morales said he would recommend the ASPIRE program to others. Lauren Erickson has shared many important life experiences with her younger brother, Kent, including birthdays, holidays, and family trips. On April 29, the Redding native celebrated another major milestone with him: graduating from Simpson University with bachelor’s degrees in organizational leadership. In addition to participating in Simpson’s spring commencement ceremony, Lauren was also selected to read a scripture passage during the university’s baccalaureate service on April 28. Lauren, 25, attended Shasta College in Redding, where she earned her associate’s in humanities in May 2015. She looked into Simpson University’s ASPIRE degree-completion program after she was accepted into a design institute in Southern California but opted not to attend because of tuition and relocation costs. Lauren was a part of a 12-month-long on-campus organizational leadership program and attended class on Wednesday nights. The university also offers a 16-month-long online organizational leadership degree. Lauren decided to major in organizational leadership because it was a good fit for her professional goals. Lauren said her personal growth was the most rewarding part of being in the program. Based on her positive experience, Lauren said she would recommend the ASPIRE program to others. After graduation, Lauren will continue working at Wildcard Brewing Co. in Redding. Because she now holds a bachelor’s, she anticipates a promotion to manager and event coordinator by the end of the summer. She is also going to assist a wedding planner to see if that’s a career she would like pursue. Kent Erickson has shared many important life experiences with his older sister, Lauren, including birthdays, holidays, and family trips. On April 29, the Redding native celebrated another major milestone with her: graduating from Simpson University with bachelor’s degrees in organizational leadership. “It felt good to work alongside each other and earn something for which we have both worked so hard,” he said. In addition to participating in Simpson’s spring commencement ceremony, Kent also gave a senior testimonial during the university’s baccalaureate service on April 28. He was also inducted into Alpha Sigma Lambda, a national honor society for continuing education students who maintain at least a 3.8 grade-point average. Kent, 21, attended Shasta College in Redding before enrolling in the ASPIRE degree-completion program through Simpson’s School of Adult and Graduate Professional Studies, in the summer of 2016. He completed his general education at Shasta and took classes from Simpson’s traditional undergraduate program for one semester before starting his ASPIRE courses. Kent was part of a 12-month-long on-campus organizational leadership program and attended class one night a week on Wednesdays. The university also offers a 16-month-long online organizational leadership degree. Kent chose to major in organizational leadership because of the adaptability the degree offered. Kent said one of the most rewarding parts of the ASPIRE program was the course content. One of the things Kent like most about the program was the integration of faith into his classes. Kent said one of the most challenging aspects of the ASPIRE program was refining his time-management skills. He worked at Cattlemens steakhouse in Redding as a server while in school and had to learn how to effectively balance work, school, and family responsibilities. Based on his positive experience, Kent said he would recommend the ASPIRE program to others. He has already encouraged several coworkers and friends to enroll in the program. After graduation, Kent plans to continue working at Cattlemens and continue job hunting until he finds a fitting career. He wants to look for a job where he can utilize his degree and has considered pursuing his master’s in organizational leadership. After taking a personality test and learning that his ideal career required a graduate-level education, Allen Schroeder decided to focus on earning his bachelor’s degree as one of the steps in achieving his professional goals. “Psychology is a good platform for social work, counseling, and pursing a graduate degree in social work or marriage and family therapy,” he said. 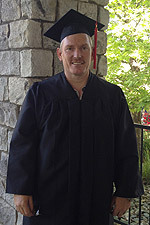 Schroeder, 41-year-old Redding resident, was one of more than 180 students who graduated April 29 from Simpson University. He earned his B.A. in psychology from Simpson University’s School of Adult and Graduate Professional Studies, ASPIRE program. Before enrolling in ASPIRE, Schroeder took classes at Butte and Shasta colleges. He looked into Simpson after hearing about it from a college academic counselor. Schroeder started taking ASPIRE courses in January 2016. He was part of a 16-month-long online psychology degree program. 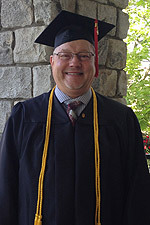 He connected with professors and classmates using email, Skype, and Moodle, Simpson’s online learning management system. In addition to psychology, the ASPIRE program offers an online bachelor’s in organizational leadership. Schroeder opted to take the online psychology program instead of the traditional face-to-face format because it was a better fit for his busy lifestyle. While in school, he worked full time as a social worker for Shasta County. He’s also married and has children. One of the program features Schroeder liked the most was the online forums. The forums also gave Schroeder an opportunity to share some of the challenges and losses he encountered while in the program. “To be vulnerable with other students and my professors caused me to grow so much more than I expected,” he said. Schroeder said overcoming the challenges the program presented, like four-week intensive courses, was one of the most rewarding parts. Based on his positive experience, Schroeder said he would recommend the ASPIRE program to others. Schroeder said having a bachelor’s degree will impact his life in a positive way because he will receive a job promotion. “The knowledge and education I received is invaluable to both my private and professional life,” he said. After graduation, Schroeder plans on celebrating his accomplishment with his family and someday pursuing a master’s in social work. Five years after taking a college sculpting class for fun with her daughters, Margaret Hampton graduated with her B.A. in organizational leadership through Simpson University’s School of Adult and Graduate Professional Studies, ASPIRE program. She was also one of the first in her large family to graduate with a bachelor’s degree. Jeanette McBroome had multiple reasons for celebrating on Jan. 21. Not only did she celebrate her 52nd birthday, she also received her bachelor’s in organizational leadership from Simpson University’s School of Adult and Graduate Professional Studies, ASPIRE degree completion program, during the school’s winter commencement ceremony. Redding resident Denise Knox’s time as a student in Simpson University’s ASPIRE degree-completion program was a time of academic and spiritual development. Knox, along with more than 230 other students, received degrees during Simpson’s spring commencement ceremony on April 30. She was also inducted into Alpha Sigma Lambda, a national honor society for continuing education students who maintain at least a 3.8 grade-point average. Knox first attended college in 1977 but dropped out when she got married. She returned to school in 2007 and earned her certified nursing assistant (CNA)/home health aide credentials from Shasta College in Redding. She worked as a CNA prior to attending Simpson. Knox explored options for returning to college and decided to pursue B.A. in organizational leadership through the School of Adult Studies. While in the ASPIRE program, Knox was part of a 16-month-long on-campus degree program. She attended class from 6 to 10 p.m. Wednesdays. Knox, a 57-year-old widowed mother and grandmother, faced multiple challenges during her time in the ASPIRE program, including struggling with family issues and finances. By attending Simpson, Knox said she was able to achieve the deeper biblical understanding she was searching for. She said she also gained a great understanding for other cultures. Based on her positive experience, Knox said she would recommend the ASPIRE program to others. Knox is unsure of how she will use her degree, but she is considering multiple I ideas, including working in family services, education, or church leadership. She is also thinking about teaching on the mission field. Growing up, Jeffrey Arndt was unable to attend both his eighth grade and high school graduations. On Saturday, Jan. 10, he participated in his first-ever graduation ceremony, where he received his B.A. in organizational leadership from Simpson University’s School of Adult Studies ASPIRE degree-completion program. He also became the first member of his family to earn a bachelor’s degree. Arndt, a 28 year-old Redding resident, chose organizational leadership as his degree because of his experience at U.S. Bank in Redding, where he has worked for the last seven years in different roles, including being a member of the wealth management team, a banker, and a teller. While in ASPIRE, Arndt was part of a 16-monthlong online degree program. He stayed connected with professors and classmates by using Skype and Moodle, Simpson University's online learning management system. In addition to organizational leadership, the ASPIRE program offers an online B.A. in psychology. Arndt first attended college after he graduated from high school in 2004, but he had to stop in order to work. He later transferred to Shasta College in Redding, where he took online classes and the prerequisite courses needed to enter the ASPIRE program. When Arndt started taking classes at Simpson, he was hoping to further his career. Shortly after starting the ASPIRE program, however, he received a job promotion, and his desire for a college degree changed. “Now my degree is for me, a trophy that signifies my completion and determination to finish school,” he said. After graduation, Arndt plans to continue working at U.S. Bank and eventually pursue his M.B.A. He also plans to spend more time with his wife, Rebekah, and son, Leon. Redding resident John Cravens has a desire to counsel people going through the process of overcoming and recovering from addictions, so he attended Simpson University’s School of Adult Studies, ASPIRE program, to earn his B.A. in psychology. “I chose the psychology major because I wanted to better understand human behavior and why people do what they do in order to gain knowledge about how to help them,” he said. 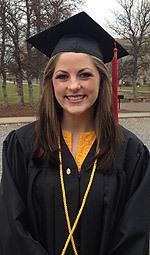 On April 26, Cravens was one of 200 students who received their diplomas at Simpson’s spring commencement. Cravens, 44, first started attending Shasta College in 2007 and decided to return to school and enroll in Simpson’s degree-completion program in 2012. One of the challenges Cravens faced in pursuing his education was time management. He had to balance working full time with family, church, and school responsibilities. He also struggled with health issues, undergoing surgery a few months ago, but he only missed one class. After graduation, Cravens plans to continue working as a case manager in the residential drug and alcohol program at the Good News Rescue Mission in Redding. He counsels men going through the mission’s 18-month-long New Life Recovery Program, helping them with relapse prevention and personal life struggles. He also teaches several classes, attends various house and staff meetings, and participates in case management of the students. Cravens is also planning to attend classes through the California Association of Addiction Recovery Resources in June and is considering pursing his master’s degree. Cravens said he enjoyed many things about the ASPIRE program, including the accelerated schedule and night classes. One of his favorite parts about the program was the cohort structure. He also enjoyed the faith-based aspects of the program. “It has been awesome to attend a Jesus-believing university where prayer and devotions are often a part of the classroom experience,” he said. Based on his experience, Cravens said he would recommend the ASPIRE program to others. On April 26, Redding resident Timothy McBrayer achieved a dream he has had for almost 40 years. After years of hard work, he received his bachelor’s degree from Simpson University’s School of Adult Studies, ASPIRE degree-completion program. McBrayer, 57, received his B.A. in business management at Simpson’s spring commencement ceremony. He was also inducted into Alpha Sigma Lambda, a national honor society for continuing education students who maintain at least a 3.8 grade-point average. McBrayer started his college education at Shasta College in 1974 and had completed two associate degrees by 1978. He decided to return to school in 2013 to further his career. McBrayer said the biggest challenge he faced while in the ASPIRE program was working full-time while going to school. After graduation, McBrayer plans to continue working full-time as the staff accountant at Neighborhood Church in Redding, a position he’s held since 2010. His job includes bookkeeping, accounting and human resources responsibilities. He also plans on attending his 40th high school reunion at Enterprise High School this summer. McBrayer said he likes many features of the ASPIRE program, including the class schedule and being in the same cohort throughout the program. He appreciated how the ASPIRE program helped him develop his conversational skills and equipped him with tools he can use in his career. Based on his positive experience, McBrayer said he would recommend the ASPIRE program to others. “I believe ASPIRE is a worthwhile degree program for those, like me, who have earned other college credits and work experience, to earn a bachelor’s degree while still working,” he said. Twenty-four-year-old Redding resident Katherine Kelly has known since fifth grade that she wanted to be a teacher and help students realize their full potential. She enrolled in Simpson University’s School of Adult Studies, ASPIRE program, as a liberal studies major to help her reach that goal. 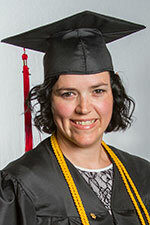 On Jan. 11, Kelly was one of 195 students to receive their diploma during Simpson’s winter commencement. Kelly’s 16 months in the ASPIRE program were full of stress and hardship. During her first semester, she and her husband, Kenny, had to move because of break-ins at the house they were renting. They also switched church families, which turned Kelly’s social life upside down. 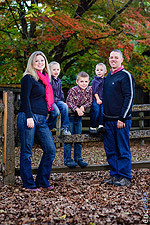 In February 2013, Kelly gave birth to their son, Lucas. The next month, her husband lost his job, so she went to work at an after-school program. After finding and losing a second job, Kenny found a job out of state in Oregon, so Kelly and Lucas traveled to see him when she wasn’t in class. Despite her struggles, Kelly enjoyed attending the ASPIRE program. She appreciated the small class sizes and getting to know other students. She also liked the class structure and affordability of the program. Since classes were only once a week, Kelly didn’t have to spend extra money for a babysitter or for gas to get to school. Based on her positive experience, Kelly said she would recommend the ASPIRE program to others. Before enrolling at Simpson, Kelly attended Shasta College in Redding. She also ran her own business as a Premier Designs Jewelry consultant, taught Sunday school for 10 years, and taught in after-school programs for four years. Kelly started credentialing classes through Simpson’s School of Education the second week of January. She hopes to graduate with her multiple-subject teaching credential in April 2015 and eventually teach math or science at the middle-school level. Sarah Lawhorne’s journey to earn her bachelor’s degree took her over 40 years. She started her undergraduate education at the University of Maine in the 1970s, and she completed it on April 27, when she graduated with a B.A. in organizational leadership from Simpson University’s ASPIRE degree-completion program. Lawhorne, a 60-year-old Redding resident who grew up in Maine, first applied and was accepted to the ASPIRE program in 2006, but due to life circumstances she postponed finishing her degree. By the time she returned in 2011, the university was offering an online organizational leadership degree. Lawhorne admits that she was never very successful at academic learning and was usually a C student. That changed when she entered the ASPIRE program. “I wanted to give it my all, so I could finally feel accomplished in my academic endeavors,” she said. Her hard work paid off, and she graduated with a 4.0 GPA, making her eligible for Alpha Sigma Lambda, a national honor society for continuing education students who receive a GPA of 3.8 or higher. Like many women, Lawhorne said, she delayed getting her degree in order to focus on family responsibilities. She worked at various jobs, including being a special education tutor, running an inn on the coast of Maine, and teaching skiing for over 35 years. Ever since childhood, she has had a passion for the Middle East; in 2009, Lawhorne made her first trek to the region to attend the King of Kings Media School in downtown Jerusalem. In 2010, she attended Youth With A Mission’s (YWAM) Marriage of the Visual Arts Discipleship Training School, in Herrnhut, Germany. She and a small team of students spent two months in the nation of Jordan teaching English and computer skills. She also participated in a Middle Eastern prayer summit in Cairo, Egypt, a few weeks after the Arab Spring uprising. Lawhorne made her third visit to the Middle East in spring 2011, when she visited Tunisia, a nation in North Africa, on another YWAM outreach trip. After finishing this trip, she felt it was time to return to California and finish her bachelor’s degree. 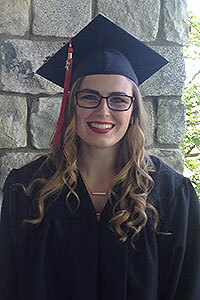 Now that she has graduated, Lawhorne is considering several opportunities, including graduate studies at the London School of Theology, where she could learn more about the Middle East at the school’s Islamic Institute. She is also investigating positions at YWAM and other non-governmental organizations where she could utilize her organizational leadership degree. “The ASPIRE program not only helped me realize my educational goals, but it also gave me the desire and confidence to expand the scope of my dreams,” she said. Leah Moua made family history when she accepted her college degree during Simpson University’s spring commencement on April 28. Though others in her family have earned two-year degrees, Moua was the first to earn a bachelor’s degree – and she did it with honors. Moua, a Redding resident, was among more than 250 graduates and one of 76 students who graduated from ASPIRE, Simpson’s degree-completion program which allows working adults to finish their degree in 16 months. Her high GPA made her eligible for Alpha Sigma Lambda, a national honor society for continuing education students who receive a GPA of 3.8 or higher. Moua’s determination to earn her degree was not only because she wanted to advance in her career. The mother of three, ages 3, 6 and 9, wanted to communicate the importance of higher education. Moua said her kids were excited about the idea of her going back to school, and she hopes that her determination plants a seed in their young minds that education is important. “My oldest son said to me, ‘Mom, when you get your graduate degree, I’m gonna call you Master Mom, and then when I grow up and get my doctor degree, you have to call me Dr. Son,” she said. Moua’s parents were also supportive of her earning her degree. Her dad, Teng Moua, said, “Leah is the first of my 10 children to graduate with a bachelor’s degree. This makes her mother and me very proud. We had always hoped our children would choose a higher education, and now Leah has done it. I am hopeful that she has influenced her family and friends in pursuing educations as well." 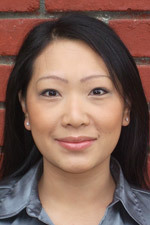 While she was in the ASPIRE program, Moua worked full-time as an intervention specialist at Parent Infant Programs, a non-profit organization in Redding that provides services to families with children with social and communication delays. Majoring in psychology proved beneficial as she works with young children, ages 0 to 3, who are at risk for autism. Moua plans to apply for Simpson’s Master of Arts in Counseling Psychology (MACP) program next fall. She hopes to continue working with children and would like to someday open her own practice and teach psychology at a junior-college level. 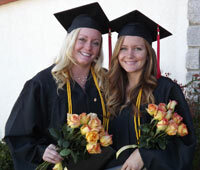 Siblings Summer Pansariang and Heidi Redmon celebrated together as they graduated with honors at Simpson University’s winter commencement ceremony on Jan. 21. 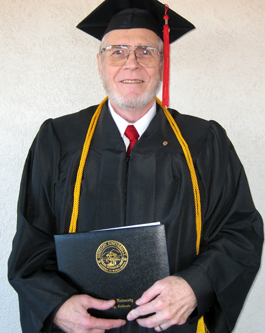 More than a half-century after Dale Sorling graduated from high school, he earned a bachelor's degree in psychology through Simpson University's ASPIRE program. The 72-year-old honor student is the oldest student to graduate in Simpson's 90-year history. He was among 133 graduates at Simpson's winter commencement on Jan. 22, including 103 from the Adult Studies (ASPIRE) program. Despite his successful career as an engineer, a business owner, and a minister, Sorling said that earning his college degree was always a dream of his. After marrying his childhood sweetheart, Carol, and raising four children--who have given him ten grandchildren and six great-grandchildren--Sorling decided to take classes at Shasta College to begin his college education. "It's been a long road," he said. "I'm not as young as I used to be. Health injuries and surgeries caused me to postpone my degree. There were some times I thought about giving up, but I wanted to prove to myself that I could do it." With a 3.8 grade-point average, Sorling was eligible for Alpha Sigma Lambda, an honor society for ASPIRE students. Sorling said he had some trepidation about returning to school later in life, but relationships with fellow classmates and professors made it easier. "ASPIRE had great professors that inspired me, and I developed close relationships with classmates. One of them calls my wife and me 'mom and dad'." In August, Sorling plans to begin the Master of Arts in Counseling Psychology program at Simpson. He plans to become a psychologist to troubled youth. "I am 72 but I still have potential and I'd like to utilize that to help someone else," said Sorling. When asked what he would tell others who are on the fence about earning their college degree, Sorling said, "There's no excuse not to do it. Financial aid is available, and it's worth it. Education is something that can never be taken away from you." After being out of school for 10 years, Regina Weston challenged herself to pursue her dream of finishing her college degree. Between working full-time, spending time with her family, and being a member of her local roller derby team, Weston needed a degree program that fit her active lifestyle. Joseph Reynolds has a knack for making family history. Through an educational journey that spanned 20 years, he became the first person in his family to earn a high school diploma, attend college, and earn a bachelor’s degree. 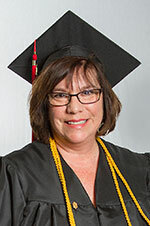 Reynolds, a 53-year-old Red Bluff resident, was one of more than 160 students who graduated during Simpson University’s winter commencement ceremony Jan 21. He received a degree in business management with a concentration in human resources management from Simpson University’s School of Adult and Graduate Professional Studies, ASPIRE program. 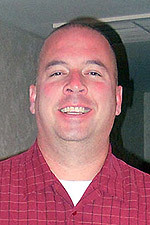 Reynolds first attended Shasta College in 1986 and received vocational training as a heavy-duty mechanic. After suffering a work injury and going on permanent disability in 2002, he returned to Shasta to find a new career path. It was while he was attending Shasta that he learned about Simpson’s ASPIRE program. Once he had completed his general education requirements, Reynolds enrolled in the ASPIRE program’s 12-monthlong business management degree program in the fall of 2015. He attended classes on Simpson’s campus one night a week on Tuesdays, with each course lasting five weeks. Reynolds said one of the best features of the ASPIRE program was the group of students he went through the entire program with, called a cohort. He liked the relationships that he was able to make. While in the program, Reynolds struggled with health issues, including an undiagnosed heart condition. He was able to overcome this challenge with the help of his cohort, professors and family. Reynolds also said that he was challenged in his faith journey by attending the ASPIRE program. Reynolds’ short-term goal is to find a job where he can apply what he learned in the ASPIRE program in a real-world setting. His long-range goals include finding a job with the potential for advancement, pursing his master’s degree, and opening his own business. Marybel Torres’ desire to teach and help the children in her Tehama County community took her on a journey to earn her B.A. in liberal studies through Simpson University’s School of Adult Studies ASPIRE degree-completion program. In addition to being a full-time student, she works multiple jobs and is busy raising her children, Deanna, 6, and Jesus Jr., 5. “Teaching has become my passion, and Simpson is that big step which will allow me to achieve my dream,” the Gerber resident said. Torres, along with 146 other students, received degrees during Simpson’s winter commencement ceremony on Saturday, Jan. 10. Students from the traditional undergraduate degree program, ASPIRE, the School of Education, the School of Graduate Professional Studies, and A.W. Tozer Theological Seminary participated in the graduation proceedings. Torres was part of a 16-monthlong liberal studies degree program that met one night a week, a typical format for the ASPIRE program, which is designed to provide affordable and convenient schooling options for working adults to complete their bachelor’s degrees. Torres also enjoyed the cohort set-up of the ASIPRE program. Before the 31-year-old started college, Torres worked as a waitress to help support her family after her father suffered a serious back injury. When she was 21, she was hired to work in the SERRF (Safe Education & Recreation For Rural Families) Afterschool Program at Los Molinos Elementary School. Even though she had no teaching experience, Torres’ bilingual skills as a Mexican-American made her an asset in the classroom. In order to advance in her career, Marybel started taking classes at Shasta College in Redding in 2003, and over the course of 10 years, she earned associate degrees in human development and language arts. She was the first person in her family to go to college. Torres first visited Simpson in April 2013 when one of her classes at nearby Shasta had been cancelled and she had time before her next class. That same day, Torres decided to transfer to Simpson. She started ASPIRE classes at Simpson in May 2013. She began credentialing classes through Simpson’s School of Education in fall 2014 and hopes to do her student teaching at Los Molinos Elementary School or Gerber School in Tehama County. Her ultimate goal is to teach in Tehama County with an emphasis on English language development. Marybel also said she was challenged in her faith journey through the ASPIRE program. Red Bluff resident DeeDee LaChance has a heart for troubled youth and children in the foster care system. In order to help counsel them, she attended Simpson University’s School of Adult Studies, ASPIRE program, to earn her B.A. in psychology. Red Bluff residents Melinda and Robert Richardson went on unique dates during the past 16 months. Instead of going to dinner or a movie, they commuted to Redding most Thursday nights to attend class through Simpson University’s ASPIRE degree-completion program. Twenty years ago, Jason Beeman had five classes left to graduate from Sacramento State University. Then the opportunity of a lifetime crossed his path – the chance to play pro baseball in Canada. For Lisa Kassik of Corning, earning her college degree was a lifelong goal two decades in the making. For Red Bluff resident Dana Thomas, earning a college degree was always a goal, but after high school, life put her goal on hold. After her husband passed away in 2004, she was unsure if she would ever earn her degree while being a stay-at- home mom. "I never thought I would earn my degree, but I'm really relieved I did," she said. "If I can do that, then maybe I can do the next step." On April 30, the 41-year-old mother of two fulfilled her goal, graduating with honors with a B.A. in Psychology from Simpson University's Adult Studies (ASPIRE) program. In 2005 Thomas returned to school to earn her bachelor's degree. Somewhat unsure if she could succeed, she started by taking classes at Shasta College. There, Professor Peter Young told her about ASPIRE and encouraged her to enroll. Having done well at Shasta, she gained the motivation and self-esteem she needed to enroll in the 16-month degree-completion program. While in the ASPIRE program, Thomas was faced with many obstacles. Her dad was diagnosed with brain cancer in July 2009, and her stepmother had a stroke a year later. "ASPIRE allowed me the flexibility to be there for my family and still get my work done," she said. Thomas said that while earning her degree was no easy task, she feels relieved and would tell anyone who is on the fence about earning their college degree, "If I can do it, you can do it!" Thomas is considering a master's degree in marriage and family counseling through the University of San Francisco. Julie Trujillo returned to school to pursue her bachelor’s in business management from Simpson University’s School of Adult and Graduate Professional Studies, ASPIRE program, in order to provide a positive example for her two children that hard work pays off. “Showing my children that hard work will provide the best future for themselves will hopefully encourage them to be the best that they can be,” she said. 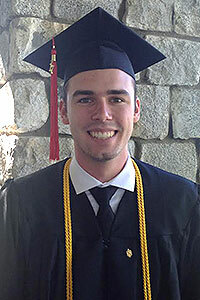 Trujillo, a 28-year-old Weaverville, Calif., resident, was one of more than160 students who graduated during Simpson University’s winter commencement ceremony Jan 21. Trujillo first attended Shasta College in Redding in 2007. She decided to earn her bachelor’s degree from the ASPIRE program because it accommodated her lifestyle. “I feel that is geared toward most people who have a family and work full-time,” she said. Trujillo enrolled in the ASPIRE program’s 12-monthlong business management degree program in January 2016. She attended classes on Simpson’s campus one night a week on Tuesday nights, with each course lasting five weeks. Trujillo said one of the features she liked most about the program was the relationships she was able to build with her professors. 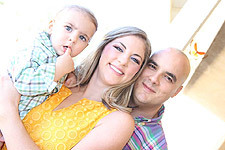 In addition to going to school, Trujillo worked full-time as an accountant for the Trinity County Department of Transportation, juggled family life and work schedules, and planned her wedding. Balancing all these responsibilities proved difficult at times, but the outcome was worth it. “I found the most rewarding part of this whole program was overcoming all those challenges and completing something I started,” she said. When Julie Marsh decided to complete her bachelor’s degree through Simpson University’s School of Adult and Graduate Professional Studies, ASPIRE program, she considered majoring in either business management or organizational leadership. After looking into both programs, she chose to pursue organizational leadership because it complemented the business experience and background she already had. Marsh, a 45-year-old former long-time Lewiston, Calif., resident, was one of more than 160 people who graduated from Simpson University during a commencement ceremony on Jan. 21. Marsh first attended college in 1989, where she earned an associate’s degree in 1991 from Shasta College in Redding. When her husband had major surgery in 2015 and couldn’t return to his job, Marsh decided to go back to school. When it came time to choose a college, Marsh said picking Simpson was an easy choice. Marsh had the opportunity to be a part of both the on-campus and online organizational leadership programs. When she enrolled in ASPIRE in January 2016, she started in the on-campus program. She took classes on Simpson’s campus one night a week on Wednesday nights, with each class lasting five weeks. When Marsh and her family moved to Portland, Ore., in October 2016, she began taking classes online. While in the ASPIRE program, Marsh balanced her school responsibilities with her freelance writing career and homeschooling her teenage-age son. She also dealt with financial challenges and moving to another state. Marsh learned she qualified for financial aid, which helped offset some of the financial strain of going to college. In additional to federal aid, she was awarded two scholarships. Based on her positive experience, Marsh said she would recommend the ASPIRE program to others. 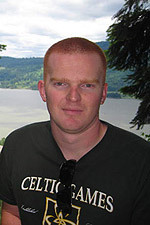 Since moving to Oregon, Marsh has continued working as a freelance writer. She has also started an online magazine called Forty and Flourishing and is looking for a job. “Having this degree allows me to pursue high-level jobs with confidence,” she said. 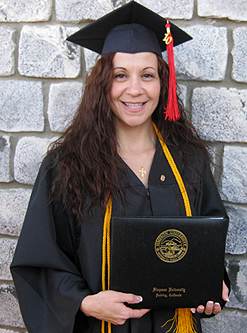 Weaverville resident Stephanie Rebelo was motivated to earn her B.A. in Organizational Leadership from Simpson University’s School of Adult Studies so she could be an example to her son and the teens she works with at a local youth center called The Factory. 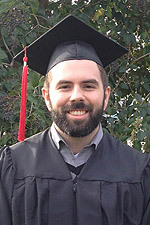 Rebelo enrolled in the ASPIRE program in August 2012 and was one of 195 students who graduated Jan. 11 during Simpson University’s winter commencement. She was also inducted into Alpha Sigma Lambda, a national honor society for continuing education students who maintain at least a 3.8 grade-point average. Rebelo’s road to earning her degree was not an easy one. Two weeks after delivering her son, Maximus Adonai, via C-section, Rebelo attended the ASPIRE orientation. Rebelo also works as the operations manager at the teen center she and her church, Weaverville Church of the Nazarene, started in October 2011. Her job responsibilities include working directly with teens, volunteers and community members, and creating events and an overall atmosphere where all teens feel welcome. In addition, she had to travel 90 miles round-trip every other week to attend class. Over the course of the program, she had to deal with construction delays and bad weather during the winter. Even though she faced difficulties, Rebelo enjoyed being part of the ASPIRE program. Rebelo was also encouraged by her professors. After finishing her bachelor’s degree in August, Rebelo started taking classes for her M.A. in Organizational Leadership (Online) through Simpson’s School of Graduate Professional Studies. She has also continued working at the teen center in Weaverville. 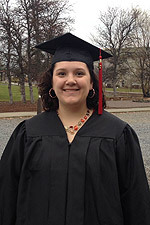 A desire to help children succeed in life inspired Weaverville resident Tiffany Wright to enroll in Simpson University’s ASPIRE degree-completion program in the spring of 2012. On April 27, Wright graduated with her B.A. in psychology. 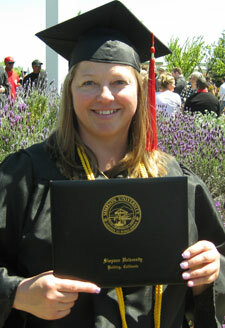 She was one of 214 students who received diplomas during Simpson’s spring commencement ceremony. Wright’s journey to obtain her degree has not been easy. She planned to start the ASPIRE program in the fall of 2011 but delayed returning to school when her father-in-law passed away from cancer. Nine months into the 16-month-long process to earn her degree, Wright’s garage burned down. She lost many personal belongings, but her home, family, and pets were protected. Wright began her college education at Southwestern Oregon Community College in Brookings, Ore., in 2003. She started to pursue her associate’s degree in early childhood education but put her schooling on hold to work full-time as a manager a of cell phone store. “I have a thirst for learning, and I think I always knew I would return to college someday. I just wasn’t sure when or how or where,” she said. Wright realized she wanted to further her education while working at a preschool for autistic children in Sacramento. Now that she has her bachelor’s degree, Wright hopes to go into social work or pursue a teaching credential or a master’s degree. “I want to find myself working with young children and help them reach their potential,” she said. A heart for underprivileged children motivated Trinity County resident Carol Scherf to return to college in her mid-60s to complete her bachelor’s degree in organizational leadership. Scherf, 65, watches three children two days a week while their mom teaches. She and her husband, Tom, have raised four children of their own and assisted 17 other children during their five decades together. They have been 4-H leaders for 41 years and very involved in county, state and national committees for the development of youth programs. Scherf, affectionately called “Grandma” by her classmates, was one of 162 students who graduated Jan. 12 from Simpson University in Redding. The university holds commencement ceremonies in January and April. Scherf and 100 others earned degrees from the School of Adult Studies (ASPIRE program). The Scherfs moved to Hayfork nine years ago. They run a cattle and sheep ranch for Mike and Polly Sumner and work three vineyards. Scherf does bookkeeping for the business. Two friends who earned their degrees through Simpson’s ASPIRE program recommended it to Scherf, who had “returning to college” on her bucket list, along with traveling and writing children’s books. For 16 months, Scherf drove the winding roads to Redding to spend eight hours in class on Saturdays. In snowy weather, Tom went with her, and they would stay overnight. What seemed a daunting timeframe at the start ended up flying by, she said. Scherf already had a two-year degree in horticulture and another in accounting. When she first saw her ASPIRE classmates, who ranged in age from 18 to early 40s, she thought how much they had to learn about life. She also gained increased self-confidence and motivation to reach her goals. 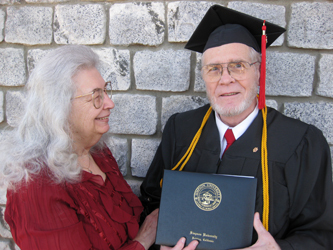 Weaverville resident Tom Bradford proves that no matter how busy life is, it is not impossible to finish your college degree. 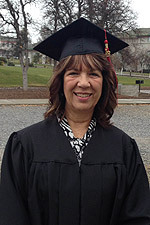 For 47-year-old Letty Garza of Weaverville, earning her degree from Simpson University fulfilled one of her lifelong dreams.